This is a popular and much reviewed anchorage. Angus and I spent the night of 22nd/23rd July there, getting time to have a walk by Loch Coruisk when we arrived. One or two trip boats visited while we were there, but the weather kept everyone else away. I thought we'd be reasonably sheltered, because the forecast was for strong winds from the SW, veering W. In the event, they seemed to curl up the loch and blow straight in. 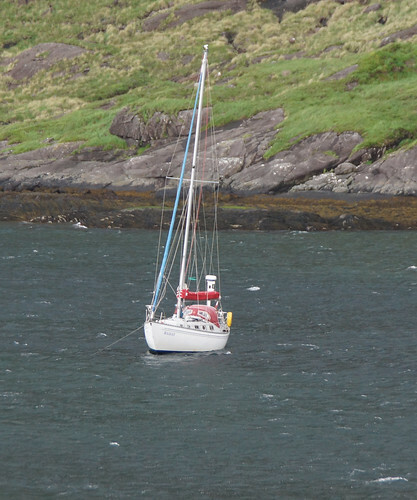 One of the trip boat skippers remarked, casually, that he didn't think the the anchorage was good holding ground. The wind increased later on the first day, and by bed time the boat was snatching hard at the anchor and swinging to strong gusts. Some of these were 35 knots, straight up the loch. Others were 50 knot katabatic demons that seemed to come from any direction. 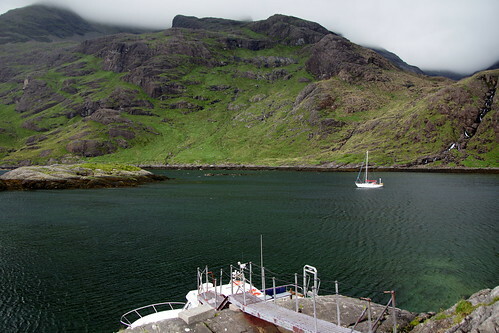 We'd seen some of them hitting Loch Coruisk during our walk, lifting dense spray straight off the surface of the water like ectoplasm in a Victorian nightmare. The GPS showed no movement apart from swinging to the rode, but the blackness beyond the cockpit seemed full of looming rocky shoreline. Watching the tethered dinghy being repeaedly flipped upside down and back up again didn't help my state of mind. I thought later that I might have felt more secure with the engine running and the radar on - both to give me some comfort about nearby hazards and because I could quickly put the boat in gear if we dragged. Anyhow, we were fine. I think the anchor must have dug at least a metre into the thick mud, much of which came up onto the foredeck in the morning and got all over Angus' foul weather gear.